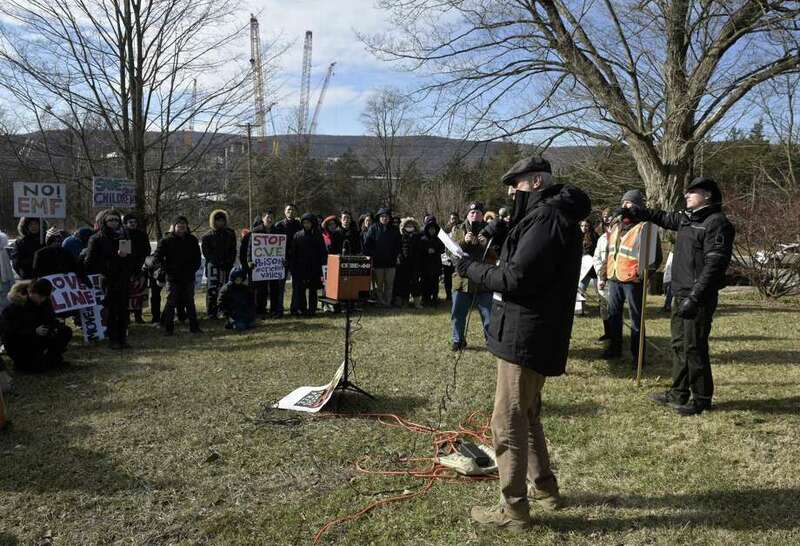 Actor/activist James Cromwell addresses protesters near the Cricket Valley Energy Center on Saturday in Dover Plains, NY. Cranes used for the construction of the center can be seen in the background. KENT — When a natural-gas power plant comes online next year on the New York border, Connecticut residents will know exactly how it’s impacting their air quality. An air monitoring station was just installed at Kent School so that it can establish a baseline of air quality before Cricket Valley Energy Center comes online in 2020. The controversial plant is in Dover Plains, N.Y., about five miles from Kent School. Some residents in New York and Connecticut have protested its approval, citing environmental and health concerns for those living closest to it. A group called STOP Cricket Valley held a protest Saturday, where actor and activist James Cromwell spoke. The new monitoring station at Kent School, along with several satellite stations in the area, will analyze air samples to track the pollutants in the air. This will help residents and environmentalists ensure the plant is not worsening Connecticut’s air and provide evidence to stop or rectify the plant’s operations if it is. Cricket Valley is expected to produce 1,110-megawatts of energy. “We have bad air from Ohio that reaches us, so why wouldn’t the bad air from Cricket Valley reach us?” said Wendy Murphy, of the Western Connecticut Clean Air Action, a group of residents dedicated to protecting the air. The region’s topography and microclimates have been a concern for many area residents and what that will mean for how the plant’s emissions settle. There are hills and mountain ranges, as well as valleys and bodies of water. Cricket Valley is expected to produce carbon monoxide, nitrogen oxides, particulate matter, volatile organic compounds, sulfur dioxide, sulfuric acid and carbon dioxide. These amounts are within the federal and New York approved limits. By installing the monitoring station now, the group will be able to see how it reacts to different wind patterns before the plant’s operations begin. WCCAA formed in July after residents learned the plant was being built. The group has always decided to use a scientific approach for the plant, while other opposition groups have taken more of a legal or protest approach, including when four New York protesters were arrested after chaining themselves to a tractor to prevent equipment from getting to the facility. WCCA, along with Kent School and other environmental organizations decided to purchase a monitoring station and create a network of satellite stations after the state Department of Energy and Environmental Protection said it couldn’t add a station due to costs, staffing and that the preliminary reports showed the impacts would largely be southwest of the plant in New York. DEEP already has monitoring stations 18 and 26 miles away in Cornwall and Thomaston. The group selected a station from Aeroqual, which is considered to be an emerging superior technology that is much cheaper than the state equipment. DEEP just concluded a test run on the piece that is now installed at Kent School. The company, though based in New Zealand, has an office in Farmington and is working on a five- year contract with the U.S. Environmental Protection Agency to test its devices in the U.S.
“It tracks very closely to the state’s much more expensive station,” said WCCAA Chairman Michael Benjamin. The main station costs $47,000 and a satellite station costs about $4,500. The satellites monitor all of the same emissions, but don’t track the meteorological conditions, such as temperature and humidity. WCCAA board members are working with their towns and local conservation groups to purchase more satellites so the network can expand and show a more accurate representation of how the emissions are traveling from the plant. They will be installed strategically, ensuring the equipment isn’t picking up exhaust from cars or nearby restaurants. “We’ve been astonished at how much ready support there’s been,” Murphy said. Environmental groups, schools and towns have all come on board with donations or purchasing satellite stations. Washington already purchased a satellite station, while other towns and groups won’t know until the budget is done. “One of the benefits of getting a network is we’ll have sampling at multiple elevations and microclimates to get a complete picture of the air quality,” Benjamin said. All of these numbers collected through the machines will then be fed into a database that is accessible online. Benjamin said they are trying to see if DEEP or a university will partner with the group to analyze and oversee the numbers. DEEP Spokesman Chris Collibee said the department will help the group understand the samplings and answer questions. “We will provide assistance with interpreting the data and other technical expertise as needed,” he said. Their involvement might go a step further though if a bill state Sen. Julie Kushner, D-Danbury, just introduced passes. The bill will require the state to conduct an air quality study to create a baseline. “This is something the state has an obligation to its citizens to do,” she said. Kushner said the state needs to conduct a study so that it is verified and in accordance with the best practices. She said whether the study would be done with Kent or if that station would be folded in under DEEP will have to be determined. “I applaud the folks in Kent for taking this initiative,” Kushner said.